This fabulous, one of a kind, year-round Cranberry Lake House features a very private, picturesque setting with stunning views of Matilda Bay, 107’ waterfront with easy access, sandy shoreline, great swimming, a raft, a large dock, a fishing boat, 2 kayaks, a canoe, and a paddleboard. The sun is always shining somewhere on the huge yard, from early morning to late afternoon, where there is plenty of room to spread out, play games, throw a Frisbee, converse in the garden, or simply read a book in the peace and quiet. There’s even a fire pit by the waterfront for campfires and roasting S’mores. The custom-designed, three-level home is spectacular and boasts a two-story great room with vaulted ceilings, a floor to ceiling Quadrafire fieldstone fireplace which heats the main and second floors, a gourmet kitchen, 5 bedrooms, with the library and game room functioning as the 6th and 7th, 3.5 baths; altogether 3,600 sq. ft of spacious, gorgeous living areas. Built in 2007, the architect placed the house in the perfect spot to capture sunlight all day long, even though surrounded by trees, and custom designed the windows to maximize the light and views from virtually any position within. Just step outside of the great room onto the 2,200 sq. ft. wrap-around deck to enjoy the amazing lake views and the splendor that surrounds you. This is the perfect spot for morning coffee, savoring scrumptious meals, or enjoying your favorite beverages at the end of the day while you share all the wonderful experiences at this mountain paradise. There’s also a charming, 9’x11’ screened room built into the deck that is ideal for catching up on your summer reading, renewing conversations, or perhaps playing cards or board games. It even offers a quiet spot to sit back in the fresh air and “rest your eyelids”. The cooks in your group will love the kitchen with high-end appliances, like a Kitchen-Aid 6 burner gas stove and oven, side by side refrigerator/freezer, abundant cabinetry, granite countertops, and an island with sitting area and prep sink. Fire up the propane grill (no refills required) on the deck and soak in the beauty of the woods and waterfront while those incredible aromas tantalize the hungry campers. Food never tastes better than at the lake. All the bedrooms are spacious, with 9’ ceilings, large screened windows, and easy access to the bathrooms. The master bedroom has a walkout balcony, huge closets, large master bath with walk-in shower, and a deep tub. There are two bedrooms on the ground floor; one with a doorway opening directly to the back lawn and waterfront. The ground floor also has a laundry room with washer and dryer, and an unfinished game room with a queen and bunk beds, and walk-out to the waterfront. This vacation home is all about location and the Adirondack lifestyle. Although you may never want to leave this special place during your stay, there are plenty of things to do in the surrounding areas. 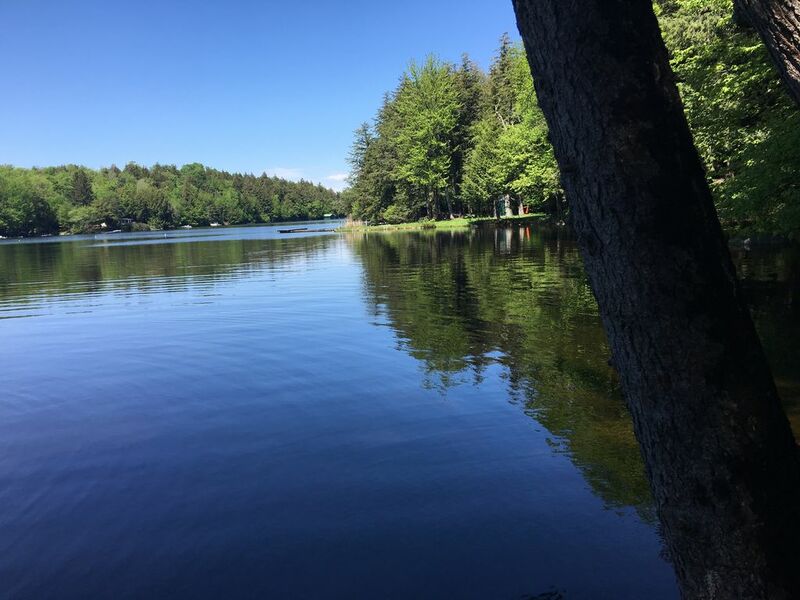 Located in the heart of the wilderness area of the Adirondacks, there are countless hiking and waterfall trails, and you are less than an hour away from the High Peaks region which offers some of the most spectacular scenery anywhere in America. The Lake Placid Olympic region is just an hour away and is a fascinating place to visit the venues like the “Miracle on Ice” Arena, the 70 and 90-meter ski jumps, where you can actually take an elevator to the top and see what it looks like staring down those incredible chutes. The shopping and touring in Lake Placid Village is also fun. The Wild Center, a natural history museum of the Adirondacks, is a great outing for the whole family and is just 25 minutes away. This is the perfect place for your family and friends to gather! Come stay at our special retreat and create memories that will last a lifetime! Cell Service is available in the area. Floor to Ceiling field stone fireplace that heats most of the first and second floors. Wood is provided. Parking for 4+ cars in the driveway. Renters may park their cars (2) in the garage and store some items used occasionally. Bath and hand towels are provided. Guests must bring their own beach towels. Great Room with floor to ceiling glass on two walls offering great views of the lake and woods. Side by side refrigerator and freezer. 6 burner gas Kitchen-aid and oven. Gourmet Kitchen, with high-end appliances, abundant cabinetry, spacious granite counter tops, center island with seating and prep sink, and all the accouterments. The well water is drinkable too! Dining area is in the Great Room with beautiful views of the lake and woods. There is a large HD Flat Screen, "Smart" TV in the Great Room, so guests can use their Netflix accounts. there is also a smaller Flat Screen, "Smart"TV in the Game Room on the ground floor. There are plenty of DVDs to view. The unfinished game room will be a fun place to play. More to Follow! Wii Game Console and Games. The yard is large and has both lawns and gardens. The master bedroom has a walk-out balcony. Two kayaks, one canoe and paddleboard are provided. A 14' Voyager Discovery fishing boat with a 9.9 hp motor and a trolling motor is included. 1,200 sq. ft. deck overlooks the waterfront, the woods, and the private bay. There is a generator that will automatically turn on if the power is lost. We stayed here for a long weekend and had family in and out -- ages ranged from 3 years to 82 years old. We all had a great time, lots of things to do. The home is set up perfectly to cook, eat as a big family, play games, hang out outside, go for a boat ride, take out the canoe, cook s'mores, etc. It really was a lot of fun. And we could not ask for a better stocked kitchen. Also, the place was very clean. Loved it! The house was wonderful. It was immaculate when we arrived and had so many perks. The garage had games for the kids as well as in the library. The kitchen had everything anyone would need. The boat, kayaks, canoe and board were all used and enjoyed. When we arrived the owners had left a welcome basket with M&M's, pistachio nuts, coffee which was such a welcoming surprise. The rental agents were very helpful as well. The only problem was there is no air conditioning and the weather was very warm Cooking for 9 people most of the time in the kitchen was unbearable with the heat. We were a little upset with the rental agents as after signing a contract and paying in full, we received a revised contract which we were told we needed to sign before receiving our arrival instructions. In all, we would recommend this rental to anyone needing a place for a large family outing. Beautiful well furnished home on scenic Cranberry Lake! We enjoyed our week at your home on Cranberry Lake, with our multi-generational family. Plenty of space and nice layout for everyone! We made good use of the outside amenities; canoe, kayaks, and fishing boat. Would have like deeper water at the dock for swimming, but took floats and boats out to the swim raft. This house had easy access to major roads, and we took several hikes and day trips in the area. Hope to enjoy time on Cranberry Lake again! What an INCREDIBLE property. It was not just as described, but the pictures and description almost didn't do it justice. The house was immaculate and included all of the bells and whistles (kayaks, boat, canoe, etc.). Unbelievable views accompanied our meals, which we BBQ'ed and ate on the deck. We fished off the dock and caught a lot of sunfish and bass. The lake is so calm, yet there is access to the bigger, more open water as well. This was the PERFECT spot for our family outing. Everything went smoothly, from the payment to accessing the house to the instructions left for us. We will be back!!! HIGHLY RECOMMENDED!!! Please note that weekly bookings are on a Sunday to Sunday basis. The maximum number of guests is 10 from Sept 3, 2018-June 1, 2019. Additional guest fees may apply if approval is granted from the property manager to allow more than 10 guests. In the event of cancellation, all monies paid will be returned only if the property can be re-rented. The damage deposit, if paid, will also be returned.